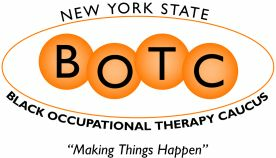 The NYSBOTC provides scholarship(s) annually to deserving Black occupational therapy students in New York State. We gladly accept and appreciate any and all donations. Please note that all your donations are tax deductible as we are a 501c (3) and 501c (6) organization. Click on the link below to make a donation to the Delores B. Chandler Scholarship Fund. Thank you in advance for your support. Please indicate if you are a practitioner or student. This job title refers to your title at your place of employment.